What’s So Great About Books, Anyway? I will be supporting Allison in two ways throughout November as she participates in National Novel Writing Month. First, I will do my best to stay out of her way. Second, I am taking on her blog duties by writing four or five guest reviews and possibly some other posts. I continue my reviews of childhood favorites with another book—actually, an entire series—that you may have trouble finding. However, you just may find Danny Dunn books in some libraries. I never looked at The Hardy Boys or Nancy Drew. I discovered Danny Dunn in fifth grade, and that was enough for me. That’s not to say that Danny Dunn is in the same vein as Nancy and the Boys. He’s not. Danny Dunn is a burgeoning young scientist, not an amateur detective. But if you think scientists can’t have exciting adventures, you’re wrong. Just look at these great titles: Danny Dunn on the Ocean Floor; Danny Dunn, Time Traveler; Danny Dunn and the Automatic House; Danny Dunn and the Voice from Space; Danny Dunn and the Smallifying Machine; Danny Dunn and the Swamp Monster. Danny Dunn was a precocious red-head who, more than anything, was an expert at getting into and out of trouble. He can be described in one word: headstrong. His widowed mother is the live-in housekeeper for Professor Bullfinch, a renowned scientist and the quintessential absent-minded professor. Danny’s two friends are mopey and pessimistic Joe, and rationale and cool-headed Irene. And then there’s Dr. Grimes, Professor Bullfinch’s curmudgeony colleague. In each book, Danny and his friends find themselves caught up in a science-based adventure. In the series’ first book, Danny’s klutziness ruins the Professor’s experiment, inadvertently creating a substance that, when charged with electricity, negates the effects of gravity. Months later, the first anti-gravity spaceship is ready for launch. Touring the ship with Joe, the Professor, and Dr. Grimes, Danny klutzes his way into space by accidentally activating the paint. But then when the group decides to return to earth, they discover that the relay mechanism is stuck, and there’s no way to cut power (which is solar) to the anti-gravity paint. Yikes! In other adventures: Danny is shrunk to the size of a bug in The Smallifying Machine (two decades before “Honey, I Shrunk the Kids”), meets Benjamin Franklin in Danny Dunn, Time Traveler, and searches for a deadly monster in The Swamp Monster. 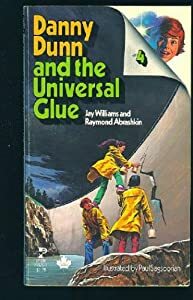 The first book in the series, Danny Dunn and the Anti-Gravity Paint, was published in 1956; the fifteenth and last, Danny Dunn and the Universal Glue, in 1977. The series was unfortunately cut short due to the premature death (heart attack) of its primary author, Jay Williams, at the age of 64. The books’ co-author, Raymond Abrashkin, had already died even more prematurely at the age of 49 from ALS, also known as Lou Gehrig’s Disease. (ALS links the Danny Dunn series to the first childhood favorite I reviewed, The Monster at the End of this Book, whose author Jon Stone also succumbed to the disease.) Although Abrashkin died after just the fifth book in the series, Williams insisted that he continue to be given co-author credit on all subsequent books. I can’t find any information on how the two teamed up or came up with the concept for the Danny Dunn books. I do know that Abrashkin co-wrote, co-directed, and co-produced (as Ray Ashley) a movie called “The Little Fugitive” (1953), which was nominated for an Academy Award, and that Jay Williams played the part of the pony ride man in that movie. Perhaps they met through that movie, or perhaps they knew each other before. I know it won’t happen, but I wish there would be a revival of interest in the Danny Dunn series. The stories really are great, and I think there are many kids today who would enjoy them as much as I did–and still do. I have 11 of the 15 books. As soon as I complete the set, I’ll read the series again from beginning to end. Voraciously. Maybe the last four books could be a Christmas gift to myself. What do you say, Allison? 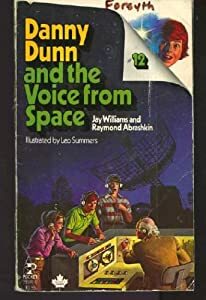 5 Responses to "The Danny Dunn series, by Jay Williams and Raymond Abrashkin"
THESE WERE THE BIGGEST READING MEMORY OF MY CHILDHOOD, NOW I HAVE FOUND THEM AT LONG LAST!!….. I read and owned all these books when I was a kid. They were my favorite series that I read over and over again. Now I’m kicking myself for donating them all. I would love to read them to my kids now, or have them read them, but they are too expensive to buy and not in our local library. Maybe you could buy just two or three? They can be found on AbeBooks for as low as $3.50 each — with free shipping. If you think your kids would like them, it would be a shame for them to miss out.